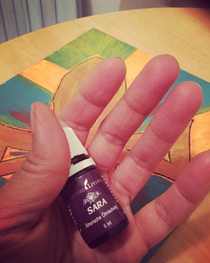 As my monthly subscription box came in, I looked forward to trying ‘Sara’ out. I heard many good things about it. The Transformations of this weekend were many - but the most Important : I celebrated my 38th Birthday and I thought I was going through my ‘changing years’. At one point I used this Essential Oil in my diffuser and also applied it to my body. Soon after, ever so gently, a memory from childhood came to the surface. As quickly as the memory surfaced, I was able to move on. Seeing and experiencing for myself the gentleness of this blend, I definitely plan on using it during future Client Sessions. *I use Essential Oils often, for myself and family and it’s one of the biggest reasons why I decided to become an Independent Distributor. Definitely wonderful tools for therapist and for personal use.